Worn by World Champions. 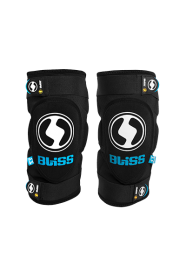 Bliss Armourgel technology provides a flexible gel pad that moves with you when pedalling yet hardens on impact in the event of a crash. 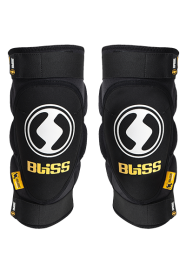 XC, All-Mountain, Enduro, and Downhill, just select the protection level for your riding style and you will forget you are wearing them. 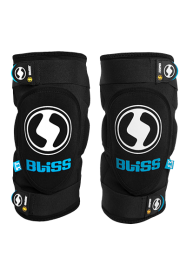 All Bliss ARG Minimalist, Vertical and Comp knee pad models use cutting edge Armourgel technology which has been certified to CE EN 1621-1 or higher (the Euro standard for motorcycle kneepads). Armourgel absorbs and dissipates energy greatly reducing the impact forces transmitted to the body. (See our lab page and videos which show why Armourgel has the leading impact protection properties on the market). Armour gel pads self re-generative and are not de-graded by repeated impacts. They are easy clean and can be washed 50 times at 40C with no loss of impact properties. The Classic range provides CE certified protection with foam at a hip pocket friendly entry point. 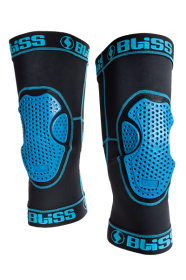 What ever the choice, the ergonomic cut and air venting makes all Bliss Knee pads comfortable riding protection.